Tasty Barbecue Charcoal Grill is one of those places that I’ve been eating at for a damn long time and I’m pretty sad that they had to close down because the Queenstown area is slated for redevelopment so the hawker centre is going to be levelled as well. As you can see, most of the stalls at the hawker centre have closed already, leaving only this western food stall and another drinks stall nearby open. It’s practically deserted at dinner time! But there still quite a number of faithful customers who come here for some tasty bbq food! 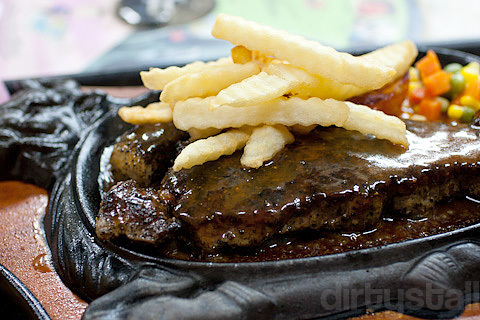 This is what I always order when I’m here, a black pepper sirloin steak. I’m not going to pretend that this is something tender or flavourful like a proper steakhouse, but it is a properly grilled chunk of steak with a thick layer of delicious and special brown sauce. 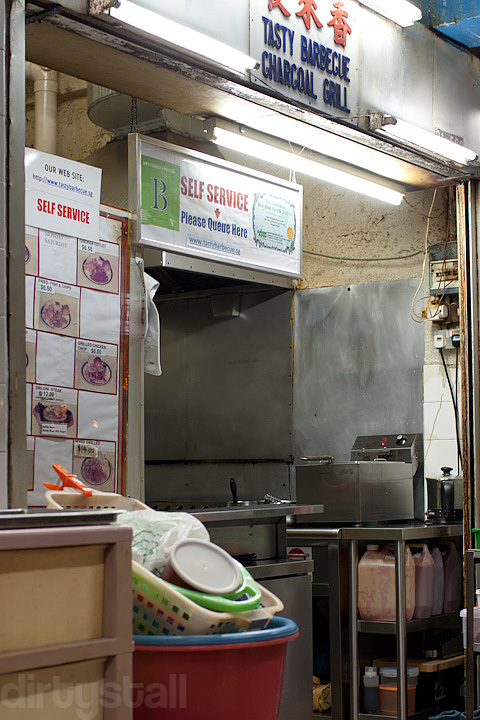 You won’t be getting something like this from most hawker centre western stalls. 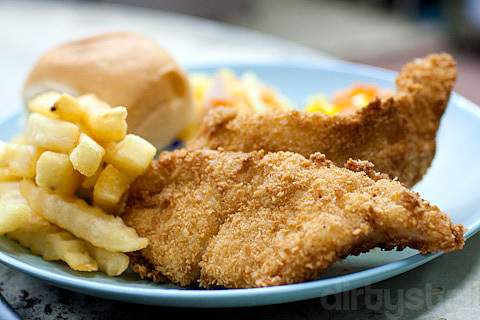 Of course besides steaks, he also sells the other typical western fare you find such as pork chops and fish & chips, like you see below. Like the steak, he serves 2 large fillets of fish which flake away tenderly when you bite into them. Unfortunately since the Tasty Barbecue Charcoal Grill is no longer there, I can’t provide an address for it but he does have a website here where he will put up his new location once he finally finds a suitable place. I’m really looking forward to eating his steaks again! 9 Responses to "Tasty Barbecue Charcoal Grill"
Wow the hot plate for the steak reminds me of the good old days of Jack’s Place. How much does the steak cost? Do let us know where it is located to. I hope its north area! Haha yeah the hot plates that they used was exactly the same ones that Jack’s Place used. I can’t remember the exact price but I think it was $12 per steak. $12!! 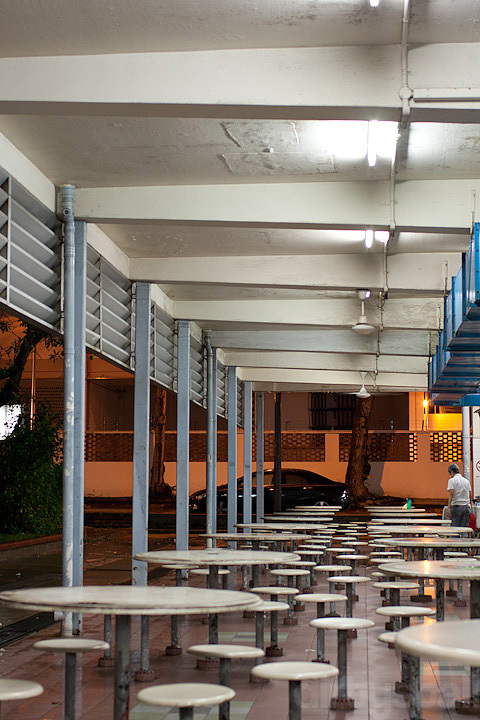 thats pretty high for a hawker centre. I hate redevelopments because it always means that some of the stalls will be gone forever and prices will definitely increase. The char grill stall also uses the hotplate. Yah very sad case. A lot of good places are lost forever and the rest just increase prices. Amazingly the prices at the renovated Hong Lim centre are still the same! Tasty Barbecue Charcoal Grill is now opened at Newton Food Centre, Stall 64. Prices have only risen by $0.50 or $1 considering Newton is a prime area. Nice to know that te prices are still around the same. Time for a visit!